When Should HGH Therapy Begin? Many times I have been asked if there is a certain age when human growth hormone therapy for anti-aging should begin. I have also had those in their teens and 20's ask me about taking HGH at their age for increasing their height and for other reasons. We know that growth hormone release by the pituitary gland begins to decline not long after the end of the growth and development stage, in the mid 20's. Regarding when HGH therapy for anti-aging should begin, one prominent researcher has the opinion that there is no need to wait until you are a senior citizen to enjoy the benefits of human growth hormone restoration. This researcher says that treatment has been aimed more toward those 65 years of age and older even though clinical research shows that some people may already have elderly levels in their 40's. She believes it is better to begin sooner rather than waiting and then trying to treat tissues of the body that have been deficient in growth hormone for years. Although it is recommended that we address our decreasing HGH level sooner rather than later most people do not need to go directly to a full hormone replacement therapy (HRT) with injections. Dr. Klatz, of the American Association of Anti-Aging Medicine (A4M), stated in his book Grow Young With HGH that if you are like 1/3 of the older population and are severely deficient then you should consider the injections. However, if you are like 2/3 of the over 45 population and your pituitary gland is still producing growth hormone you can achieve benefits safely and at a fraction of the cost by using clinically proven non-injection products. Another authority on the subject is of the opinion that people in their 30's and older can take non-injection products to boost their HGH and also help to reduce the decrease that usually occurs with aging. Some in their teens and 20's may wish to take human growth hormone therapy for various reasons other than for health conditions such as Growth Hormone Deficiency (GHD) and Turner's Syndrome, which are medically accepted reasons for this age group to need growth hormone therapy. Healthy young people may consider HGH for building muscle, to increase height, and for weight loss. Human growth hormone should not be taken lightly. Those in their teens and 20's who take the injections when they have no deficiency are asking for problems. This age group should not take any type of product without their private healthcare provider's consent and management. Human growth hormone in homeopathic form is much safer than the injections because it is not a full hormone replacement therapy. It will not shut down the pituitary gland's own production of growth hormone as the injections are likely to do. Instead, it helps the body to naturally optimize its own release of HGH. It also doesn't carry the same risk factors and possible side effects that the injections do. For these reasons some doctors use homeopathic HGH when a serious deficiency does not exist yet the patient wants to optimize their growth rate while still in the growth and development stage of life. Some doctors may also approve the use of homeopathic HGH for certain health conditions that do not require the injections. This is a great time in health research and development in that we are learning how to intervene in the aging process and restore many of the aspects of our youth. In anti-aging medicine studies are showing that we should be able to improve our resistance to disease, reverse and slow many of the effects and diseases associated with aging, improve our quality of life, and extend our life span. We already know that by restoring certain hormones to a more healthy level we can help to recover our health, our vigor, our looks, and our sexuality. Thanks to ongoing cutting edge anti-aging research we now believe that the fountain of youth lies within our own cells, we just need to learn how to access and utilize it. I began taking homeopathic HGH when I was almost 39, back in 1999. I still take homeopathic HGH now at age 56 and I have never taken the injections. I only wish it had existed when I was 30 because I believe it is better to keep our hormones at a healthy level rather than waiting until damage has been done and then need to repair the damage. However, it is never too late to focus on improving and restoring our health. We have clients in their 70's and 80's who are reporting substantial improvements in various areas of health and fitness. The body is amazing with its inborn and never ending focus on trying to heal and restore itself when it has the proper tools. Please click for information about the HGH products I take and recommend. The HGH formula used was rated most effective at increasing human growth hormone in the body by legitimate independent randomized double-blind placebo-controlled IGF-1 clinical studies, which as a nurse is of paramount importance to me. Lastly, regardless of age I always recommend everyone consult their private healthcare provider about taking any type of health product. Question: I am 32 years old. I have been reading your client testimonials and noticed that many of the people who use your HGH are much older. Is it safe to start taking the HGH Plus at my age or would it be better to take it later in life when my HGH levels have dropped some more? I don't want to be in a predicament where I start taking it now and then when I am in my 50's it will no longer still benefit me. But I was wondering if I started it now if it would have a preventive effect? Please tell me as much as you know. Thank you! Answer: It is true that many of our testimonials come from those older than yourself, however we also have many in your age group who take our product. I think it may be that the people in their 40's and up have already aged more, so they are more excited when they see the improvements and so may be more apt to write a testimonial. The good thing about homeopathic HGH is that it works with the body. It only helps in the areas that need help. For instance, I remember one 13 year old girl whose mother was at her wits end looking for something to help her daughter's fibromyalgia. She had carried her to numerous doctors and nothing they tried helped her. 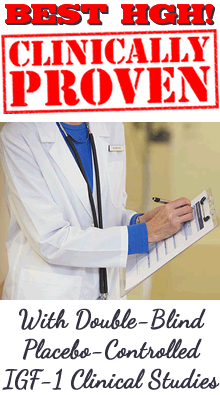 The mother got permission from her daughter's doctor for her to try our HGH product. It helped her so much and so fast that when they saw her improvements her grandparents and also her school teacher called and ordered some for themselves. I understand your concern, and I would agree with what you say if you were considering HGH injections. It would not be smart to make yourself dependent upon a synthetic hormone at your age. Homeopathic HGH should work with your pituitary gland to help your release of human growth hormone remain optimum. Question: Interesting, this is kinda what I wanted to know. I know that (HRT) or the injections has been known to make the gland stop working and then you have to take the injections for the rest of your life. but apparently the HGH Plus that you sell works with the body. As I have for the last year been eating mostly natural and organic foods, trying to be healthy and exercise often, however I will be turning 21 soon and have been a coach potato for the first 18 years as the rest of the family was. I am the first to make a change and hope the rest will eventually join me. I have lost a lot of weight and I feel much healthier. I also take vitamins etc. However I am sick all the time and this product says it improves the immune system, It would help with weight loss and muscle building? I also know that my metabolism and some other body functions will always be lower than normal because of my previous obesity, which brings me to my point you say that 30 is a good age to take it but that kids take it occasionally. Answer: I congratulate you on changing your lifestyle. You have changed your diet and you are now exercising. These are major steps toward optimizing your health and fitness, and you have done these things now, while you are still so young, so I would expect you to have a very healthy future. I was surprised when you said that your metabolism and other body functions will always be lower due to your past obesity. I don't know your entire health history, but based on what you wrote I would expect your metabolism and body function to continue to improve with your healthy lifestyle. Regarding you taking our product, it may very well help to balance your hormone levels if they are low, and improve your metabolism, organ function, and immune system; I recommend you speak with your private doctor about this. When speaking with your doctor you should make sure he/she understands that our product is a safe homeopathic product, and is not a synthetic hormone replacement therapy as are the injections.